"This meal isn't fat free, but it is a recipe that I serve at least once per month anyhow. :D. It's a great dish on its own, but I normally serve it up with some fresh Italian bread and basil-flavored olive oil for dipping. Wicked yummy pasta, people!! Serve this with a bowl of freshly grated Parmesan cheese on the side, so that people can decide how much they feel like using." Heat 1 tablespoon of olive oil and 1 teaspoon of butter in a heavy skillet over medium heat, and cook and stir the Spanish onion and garlic until the onion is translucent, about 5 minutes. While onions and garlic are cooking, bring a pot of salted water to a boil, and drizzle in 1 teaspoon of olive oil. In the skillet, stir in remaining 3 tablespoons of olive oil and 1 more teaspoon of butter. Allow butter to melt, then stir in the clam juice, mussels, red pepper flakes, 2 tablespoons of chopped flat-leaf parsley, basil, salt, and black pepper. Bring the mixture to a simmer and cook just until the mussel shells begin to open, about 3 minutes. Stir the fresh linguine pasta into the boiling water and cook, stirring occasionally, until the pasta is tender, about 5 minutes. 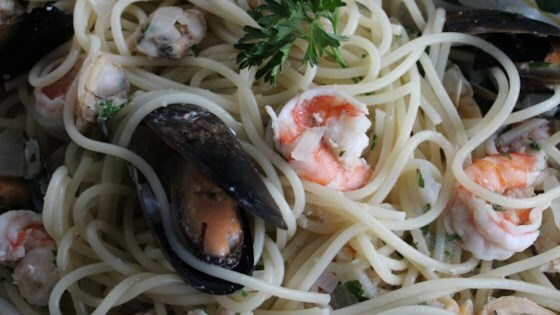 Drain the linguine and transfer to a large serving platter; keep the linguine warm. Stir the shrimp and clams into the sauce, and cook until the shrimp turn pink and the clam meat is slightly opaque, about 5 minutes. Drizzle lemon juice over the top of the sauce and stir to combine. Mix in the lobster meat and allow to cook just until heated, about 1 minute (do not overcook). Adjust salt and black pepper, if desired. Spoon the sauce and shellfish over the platter of cooked linguine, arranging the mussels in their shells, several shrimp, and lemon wedges decoratively around the edge of the platter. Top the sauce with shaved Parmesan cheese curls in the center of the sauce, and place 1 sprig of parsley in the center for garnish. There is a big difference between a gas stove and an electric stove, so cooking times will vary. Do not overcook the shrimp! We want our shrimp to be juicy. Make sure that you taste your sauce!! If it tastes awesome as is, you're good. If it needs more salt or pepper, just add it. It's really simple :). Great pasta recipe. I used fish stock in place of the clam juice because I had it in the freezer. I will be making this again. I had left over lobster and mussels (cooked) and was looking for something to do with them. I decided to try this, minus the shrimp. It was delicious.